Drawing on theory and practice from five continents, The Public History Reader offers clearly written accessible introductions to debates in public history as it places people, such as practitioners, bloggers, archivists, local historians, curators or those working in education, at the heart of history-making. 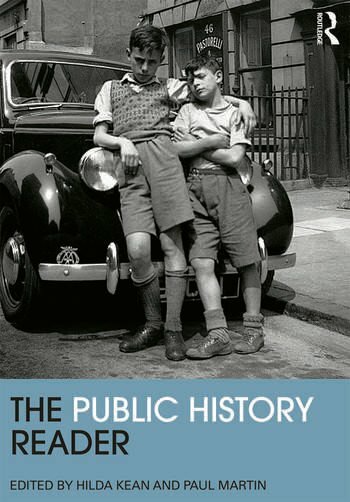 Hilda Kean and Paul Martin explore public history as an everyday practice rather than simply as an academic discipline - the idea that historical knowledge is discovered and accrued from everyday encounters people have with their environments and the continuing dialogue that the present has with the past. Divided into three parts, Part I looks at who makes history, focusing on the ways in which the past has taken on a heightened popular sense of importance in the present and the ways in which it is used. Accordingly, history, far from being ‘fixed’ in time, is fluid and is re-made to serve contemporary agendas in the present. Part II addresses the question of materials and approaches to making history. By using material more commonly within the domain of artists, collectors or geographers and archaeologists, public historians have opened up understandings of the past. Part III looks at the way in which presentations of the past change over time and their different forms and emphases. Throughout, the Reader emphasizes the challenges for public historians today. Using their own expertise in constructing and teaching a Public History MA, Hilda Kean and Paul Martin have suggested themes and indicative extracts that draw on their understanding of what works best with students. The Public History Reader is a perfect resource for all students of public history and all those interested in understanding the role of the past in our lives today. Introduction Hilda Kean Part I: Introduction: The Past In The Present: Who Is Making History? Paul Martin 1. Theatres of Memory Raphael Samuel 2. The Presence of the Past: Popular Uses of History in American Life Roy Rosenzweig and David Thelen 3. Heritage from below: class, social protest and resistance Iain Robertson 4. Use and Abuse of Australian History Graeme Davison 5. Taking History to Heart, The Power of the Past in Building Social Movements James Green 6. Making History. The Historian and Uses of the Past Jorma Kalela 7. Forty years of conflict: state, Church and spontaneous representation of massacres and murder in Guatemala Matthew J Taylor and Michael K Steinberg Part II: Introduction: Materials and approaches to making history Hilda Kean 1. Evocative Objects:Things We Think With Sherry Turkle 2. London Stories. Personal Lives, Public Histories Hilda Kean 3. The Trade Union Badge: Material Culture In Action Paul Martin 4. The future of preserving the past Daniel Cohen 5. Critical Cloth Deborah Dean and Rhiannon Williams 6. History at the Crossroads. Australians and the Past Paul Ashton and Paula Hamilton Part III: Introduction: Introduction Intangible and Tangible History Paul Martin 1. The Cult of Happiness. Nianhua, Art, and History in Rural North China James A. Flath 2. ‘Under the same roof’: separate stories of Long Kesh /the Maze Cahal McLaughlin 3. Town: creating and curating the District Six Museum Sandra Prosalendis, Jennifer Marot, Crain Soudien and Anwah Nagia 4. Golconda Our Voices our Lives Lawrence Scott 5. Something Borrowed, Something New: History and the Waitangi tribunal Michael Belgrave 6. Creating Memories Building Identities. The politics of memory in the black Atlantic Alan Rice. Further Reading. Dr Paul Martin was tutor in public history at Ruskin college, Oxford 1997-2012. He is currently a distance learning tutor with the School of Museum Studies, Leicester University. His books include Popular Collecting and the Everyday Self (1999) and The Trade Union Badge (2002).